Location: 577 Reserve Rd, Upper Coomera – Play and Learn Upper Coomera Child Care Centre. This child care building will be the third project for this client. Purchased with a development approval in place, Jorgensens have been contracted to amend the design to comply with the NCC and child care framework along with specific client requests to achieve a functional and beautiful new centre. An 850m2 Child Care Centre on 3183m2 of land with 800m2 – 28 car basement car park for staff and customer parking, along with 21 car parks externally and play scape has be constructed to a turn-key finish. 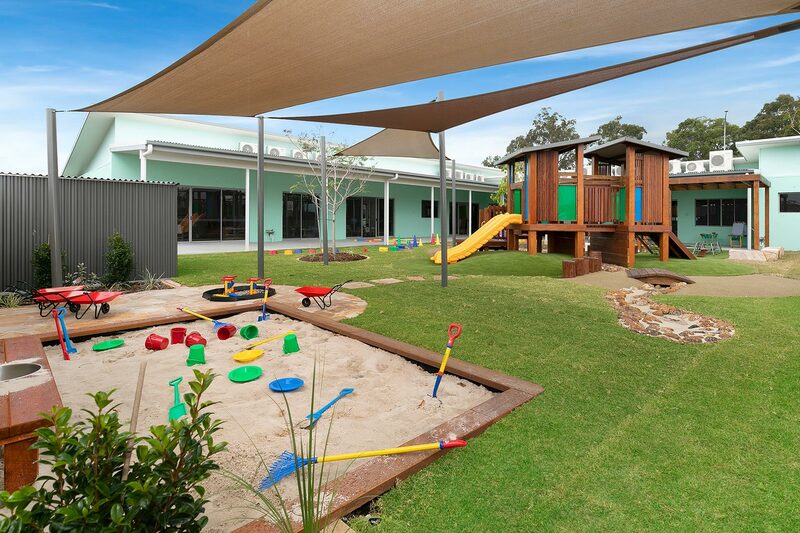 Complete with extensive retaining, bio retention and detention, play forts, entertainment areas, sandpits, shade sails, natural environments, landscaping, play equipment softfall and natural turf. ‘Dino Land’ fossil exploration and a ‘Splash Harbour’ water park this child care centre incorporates lots of fun as well as a great learning environment for these lucky kids. Commencing late November 2015 this centre was completed ready to open in the June / July 2016 school holiday period. Visit the Play and Learn Website Now!